Excited for the oSTEM conference and can't wait to see what programming you'll find? Take a look at the Program & Schedule Quick-Look, which gives you a preview of what type of programming you'll find at the conference and what workshops and panels will be available during our workshop blocks. You can find the Program & Schedule Quick-Look on our Schedule page. Erika Aldrich a junior at the University of Michigan, studying Industrial and Operations Engineering. Erika also has two dogs, Skittles and Cowboy, and she loves sports, outdoor activities, and cooking. Since entering college, Erika has held several positions with the Society for Women Engineers... Learn more about Erika here. Our newest rising star is Brett Hoffmann! After graduating from the Milwaukee School of Engineering in 2015, Brett began working at Rockwell Collins, where she writes software for the displays in military aircraft and leads aircraft support teams. Rockwell Collins is a leader in aviation and high-integrity solutions. Their endeavors include creating new features like touch screen displays in commercial aircraft and working with elements for fighter pilot helmets. Brett is an avid sci-fi enthusiast, collects music, and relishes friend and family time. A transgender person who transitioned on the job, Brett says she experienced few barriers. 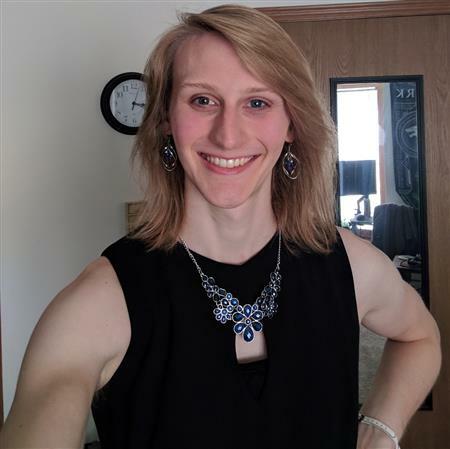 She lauds Rockwell Collins’ trans-inclusive healthcare and personal support, as well as their strong support of PFLAG and Pride in Cedar Rapids.